Purebred dogs are bred by humans attempting to create specific canines for specific needs. Such needs might change over time, resulting in changes in the breed. Some breeds might differ so much from their original purpose and appearance that they may spur an attempt to revive the initial characteristics. 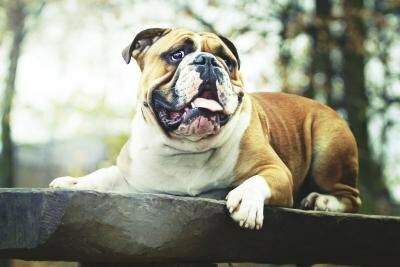 That’s the case with the English bulldog, recognized by the American Kennel Club, and the Olde English Bulldogge, recognized by the United Kennel Club. Bulldog HistoryThe bulldog got his name because he was originally bred for bull-baiting, then later for dog fighting. Bulldogs in the early 1800s were leaner and taller than current versions, with smaller heads, fewer “facial rolls,” longer muzzles and a longer tail. The modern English bulldog’s ancestors were tough, ferocious canines. Once dog fighting became a crime, bulldog fanciers bred the bad temperament out of the breed, making it a fine companion animal. In the 1970s, American fanciers began developing the Olde English bulldogge, with the goal of recreating the look of the early 19th century bulldog while retaining the good temperament of the modern breed. This dog achieved UKC recognition in 2014. Size and WeightThe English bulldog is somewhat smaller than the Olde English version. Mature male English bulldogs should weigh about 50 pounds, with females weighing 10 pounds less, topping the scales at 40 pounds. The AKC standard doesn’t specify a height for the breed; stipulating only that height and weight should be proportionate. After the age of 2, male Olde English bulldogges should stand between 17 and 20 inches tall at the withers, weighing between 60 to 80 pounds. Females should stand between 16 and 19 inches tall, weighing between 50 to 70 pounds. 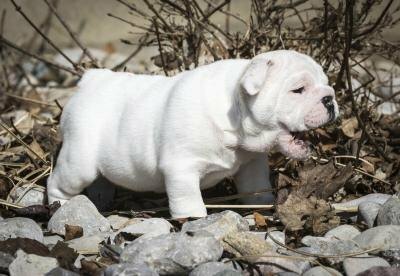 Coat ColorsAcceptable coat colors for the English bulldog include various shades of brindle — a pattern of dark striped hairs on a lighter background shade — solid white or red, solid fawn, or light tan, and the brown-and-white piebald. While a pure black bulldog is “very undesirable,” by AKC standards, it is acceptable as a black-and-white piebald. 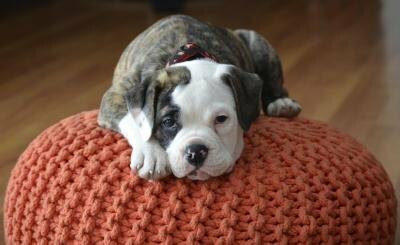 The Olde English bulldogge might appear in brindle and solid colors. Differences in AppearanceIn addition to its larger height and weight, the Olde English bulldogge is more muscular than the English bulldog. 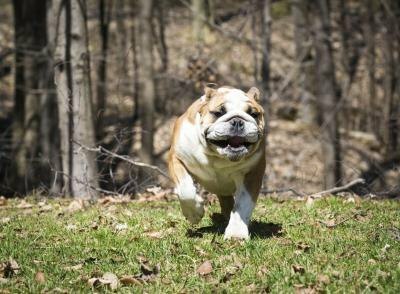 The English bulldog is not an athletic canine — for some, a walk around the block is extremely taxing. The goal of Olde English bulldogge breeders is to produce an animal that can compete in common dog sports such as agility, or accompany an owner on long walks. 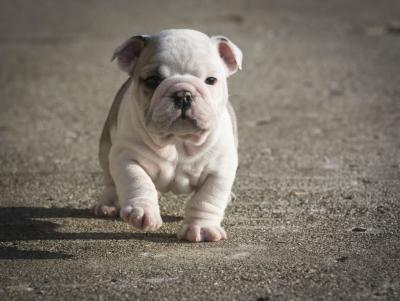 While wrinkles are part of the English bulldog’s appeal — as well as a breeding ground for skin infections — the Olde English bulldog’s skin shouldn’t be excessively wrinkled. Most important, the Olde English bulldogge’s muzzle is longer and his nostrils wider. Although he’s still a brachycephalic, or short-nosed, breed, because of his longer muzzle and nostril structure, he’s less likely to suffer the serious breathing issues that often affect the English bulldog. Basically, the Olde English bulldogge looks like the English bulldog’s buffed-up, sporty cousin. 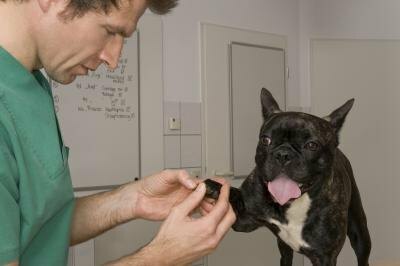 Health IssuesThe English bulldog often suffers from respiratory and cardiac issues, which can mean a shortened life span, as well as huge vet bills. Olde English bulldogge fanciers set out to improve the health of the breed. David Leavitt, one of the developers of the Olde English bulldogge, created the breed by crossing bulldogs with bull mastiffs, pit bull terriers and American bulldogs — a breed resembling the pit bull. These crosses allowed the Olde English bulldogge to retain the good temperament of the English bulldog, but also run and play — and live a longer life. New York Times: Can the Bulldog Be Saved? Copyright © 2019 HermDawg Bullies - Home of the Family Raised Bullies.